This homemade guacamole recipe has quickly become the only way I’ll make guacamole. 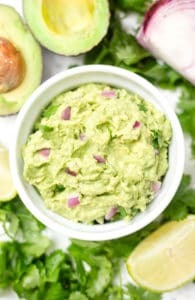 It uses lime juice, garlic powder, salt, pepper, red onion, and fresh cilantro and is the BEST dip or topping for your favorite Mexican dishes! I think some storebought foods are awesome and just as good as the homemade versions. For example, while homemade ice cream is great, the store versions rock, so I’ll happily buy it for a few bucks. But there are also some things I’d always rather make from scratch, and guacamole is at the top of the list. 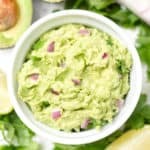 Homemade guacamole is so easy to whip up, you can’t beat the freshness, and it’s usually way less expensive to make your own. If you’re looking for something to take to a Super Bowl party on Sunday, I have the perfect guacamole recipe for you! 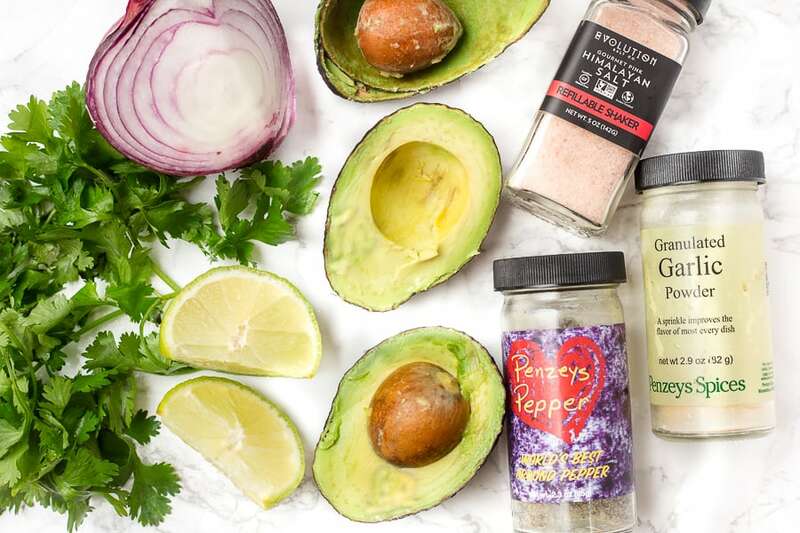 There are a lot of guacamole variations out there, but I like to keep it pretty simple– just avocado, lime juice, salt, pepper, garlic powder, cilantro, and a little sprinkle of red onion. Growing up, my family usually made a “cheater” version with just avocado and salsa, but my brother-in-law introduced us to this version and we haven’t looked back. A good rule of thumb for homemade guacamole is to plan one avocado for every two people. The recipe below lists two avocados, so it makes enough for four people, but you can easily halve it or add more avocados to adjust the recipe based on how many people you’re serving. Guacamole always seems to taste best right when you open up the avocados, so I make it just before serving. In case you have leftover guacamole, though, there are a couple of ways you can prevent it from browning as quickly in the fridge. 1) You can put the guacamole in a container, smooth the top with a spoon, and then press a piece of plastic wrap totally flat against the surface. This helps keep a lot of the air out, so it won’t oxidize as much. 2) You can save the pits of the avocados and place them in the container of leftover guacamole. Of course, guacamole is always a great appetizer with some tortilla chips. But if you’re looking for main dishes to go with your guac, can I suggest this easy one-pan Mexican quinoa, these spaghetti squash burrito bowls, or this cheese-stuffed salsa chicken? 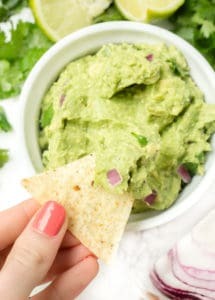 If you try this homemade guacamole, feel free to let me know in a comment or post a picture and tag me @livbane on Instagram– I’d love to see! Hope you enjoy! The BEST way to make homemade guacamole with lime juice, spices, and chopped red onion! Cut avocados in half and use a spoon to scoop out the pits. Scoop avocado into medium bowl. Mash with a fork and add the rest of the ingredients. Stir to combine and taste. Add more seasonings to taste and then serve immediately. To store leftovers, save avocado pit and place in the container with the remaining guacamole. You can also smooth a piece of plastic wrap flat across the surface of the guacamole to prevent some of the air from getting in. I totally love guac and all its variations and there are usually no leftovers. Your simple recipe really beings out the flavors of the avocado! Thanks, Meeta! I agree, I love that the avocado is the dominant flavor! Just in time for the Super Bowl! I will need to make about 100 batches because my family can never get enough. You really can’t beat homemade guacamole. Once you have the base recipe down, there are so many variations you can make. I am in love with Penzey’s spices and seasonings! And I’m always up for a homemade guacamole, No matter what time of day…bring it! Who doesn’t love an honest to goodness guacamole! Yum! It’s so basic, but it’s always a hit! Awesome guacamole! Your brother-in-law taught you well! Beautiful photos, my dear! Can never have too many options for guacamole. Love the cilantro addition – fun twist! I’m waiting on all of mine for my next batch, too! I bought a bag of 6 mini ones from Trader Joe’s the other day for a steal– $3 –but they’re not quite ripe yet! I love the red onion for some crunch and extra color! Yes!! So simple and so perfect!